To advance ethical and scientific rigor in research and evidence generation... strengthening governance, policy and practice...informing human rights action, humanitarian response, health, education, heritage stewardship, and sustainable development...delivered by governments, international agencies, INGOs, civil society organizations (CSOs), commercial entities, consortia and alliances, and individuals. The movement to evidence-based practice in the spheres of human rights, humanitarian response, health, and development is growing, welcome, and clearly justified – in terms of efficacy, ethics and equity. Equally, there has been growth of various types of ethical review bodies and regulatory mechanisms to provide assessment of and guidance on scientific rigor, ethical resilience, and other dimensions of research activity. Many of these ethical review bodies operate within academic institutions or governmental/regulatory contexts, while others operate within international agencies or INGOs, or independently. Despite the legal/treaty/conventions framework and oversight mechanisms referenced above, our assessment is that much research, evaluation, data collection and analysis in these fields proceeds without any independent ethical review, and/or with research design and methodologies that are insufficiently rigorous and not well-aligned to the research question involved and the specific geographical/ cultural context where the work will proceed. In response to the above, we have formed a new Foundation to host a global, independent, virtual ethics review and research services capability with the purpose stated above. 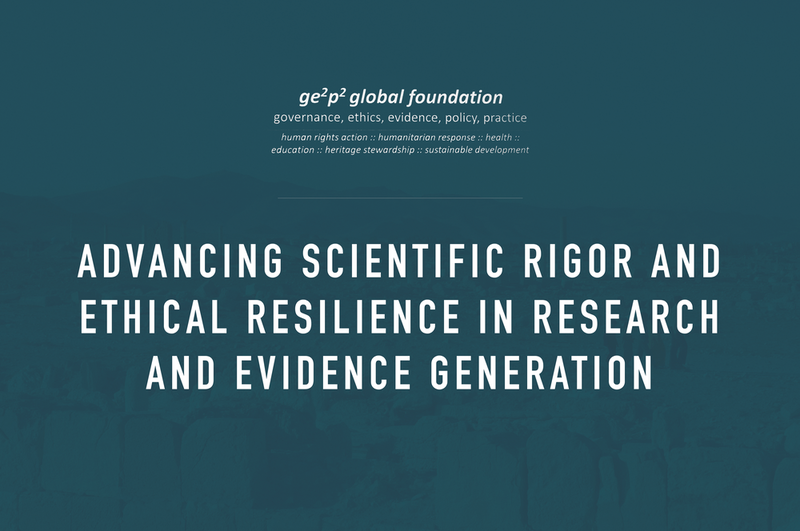 We believe that researchers and their organizations will engage independent review of their proposed work if it is available via an efficient, timely, and cost-effective process, and further supported by consultative services to strengthen research design, assure ethical resilience, and forge solutions where needed across the evidence generation life cycle. The Foundation operates through a portfolio of Centers AND PROGRAMS to focus our work. Our Center for Disaster and Humanitarian Ethics is in formation and will focus on ethics, evidence generation, and policy involving health interventions, human rights, and humanitarian response to the full range of natural and manmade disasters and complex emergencies. Donal O’Mathuna, PhD, a Fellow of the Foundation and a member of its Board of Directors, will lead this new Center as its Founding Director, and be responsible for building a team of GE2P2 Global Foundation Fellows and Associates who will conduct the research and analytical work of the new Center, and provide consultation to international agencies, INGOs, civil society organizations and donors involved in disasters and humanitarian action. If you would like to support the work of the Center for Disaster and Humanitarian Ethics click here. CVEP also offers a knowledge-sharing service through publication of Vaccines and Global Health: The Week in Review. This comprehensive weekly digest aggregates news, events, announcements, peer-reviewed articles and research in the global vaccine ethics and policy space. Content is selected from key governmental, NGO, international organization and industry sources, key peer-reviewed journals, and other media channels. This Week in Review now reaches over 2,500 leaders in the vaccine space globally each week through direct email distribution. These leaders operate in diverse spheres including government, the NGO/ONG community, UN agencies and other intergovernmental bodies, think tanks and policy organisations, academia, philanthropy, and industry. Our continuing intent is to support broad literacy and current awareness at the leadership level across the global vaccine community. Specifically, we believe that this digest – delivered each weekend – supports stronger, evidence-based policy analysis and decision-making, enhances research strategy, and functions as a productivity tool for leaders whose time to devote to reading broadly is limited. If you would like to learn more about the work of CVEP, please click here. If you would like to support the work of the Center for Vaccine Ethics and Policy, click here. If you like to support for our weekly digest -- Vaccines and Global Health: The Week in Review -- click here. Our Center for Ethics and Policy on Access to Medicines conducts research, convenes symposia and workshops, publishes, and develops ethical guidance and policy concerning fair, equitable and effective access to pharmaceutical products including drugs, biologics, vaccines, essential medicines and medical devices. In June 2017, the Center has launched an advisory services program supporting the full life cycle of Compassionate Use/Expanded Access Program [EAP] initiatives -- click here. Collaboration among international agencies, INGOs. civil society organizations, donors, country leadership and, not least, the communities and people themselves, requires continuing research to assure coherence, efficacy, equity and ethical resilience. To address our purpose and mission, the Foundation engages the competencies, experience, and insights of a global network of elected “Fellows" of the Foundation. To engage its purpose/mission, the Foundation draws on the competencies, experience, and insights of a global network of “Fellows" of the Foundation who contribute to strategy, research, governance and programs. Fellows will include academic, agency and government leaders, field practitioners, scientists, researchers, ethicists, domain and cultural context experts, scholars in the social and bio sciences and the humanities, knowledge management experts, and many others. Fellows may be independent or be functioning in government, academic, agency, NGO, or commercial contexts. Fellows and Associates are elected for one-year terms and such terms may be extended by the Board at its discretion. All Fellows and Associates participate under the leadership and direction of the President, contribute to governance by providing guidance on strategic direction as facilitated by the board, and are selectively convened as team members around specific research, projects and consultative work. Fellows and Associates are recognized on the Foundation website and convene from time-to-time and at least annually via electronic or physical meetings for knowledge sharing, to review strategy, and to affirm member guidance to the Board. The Foundation is governed by a Board of Directors. The composition of the Board strives to represent a broad range of disciplines and research agendas across human rights, humanitarian response, health, heritage stewardship, education and development, and across major geographies and organization types. We will post our annual reports, financial statements and other content supporting our commitment to full transparency. As the foundation was formed in June 2016, we have not yet posted any documents. Please visit again soon. Our work is focused on advancing ethical and scientific rigor in research and evidence generation for governance, policy and practice in human rights action, humanitarian response, health, education, heritage stewardship, and sustainable development – serving governments, international agencies, INGOs, civil society organizations (CSOs), commercial entities, consortia and alliances. This work depends on in-kind and financial support from a range of sources, including foundations, NGOs, academic institutions, international agencies, the vaccine industry, other commercial organizations, and individual donors. Wee particularly mindful of actual and potential conflicts of interest which may affect the ability of anyone associated with the foundation to participate in specific work. We will uniformly communicate any and all conflicts we identify to assure that all work products are transparent on this as well sources of support to assure maximum transparency.